The USB Recorder allows the user to record conversations with a touch of a button if on the phone or in a meeting and all conversations are saved to your pc. Delete them at anytime or archive them to a pc or a CD Rom. Record important telephone conversations word-for-word directly onto your computer to help avoid potential misunderstandings. 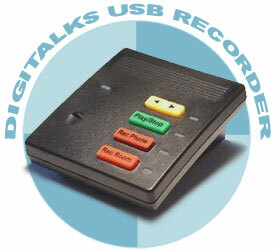 The USB Recorder makes it simple and easy. Just install the software and plug the recorder into a USB port on your computer. You can also record negotiations, agreements, sales transactions, and any other business you handle by phone. The software time/date stamps each recording, and allows you to manage your stored audio files. E-mail a recording so someone else can listen to it or transfer or copy recordings (onto a CD, for example) to keep in your permanent archives. Users can add bookmarks and write notes while a conversation is being recorded. Once a comment is entered it becomes a pre-selected point from which a conversation or recording can be heard. I.E. once the comment is double clicked the recording starts to play from that location which in this case is 9 minutes into the recording. Connect USB Recorder to your laptop and take it to work, school, meetings, etc. Executives - record all bids and offers, consultations, discussions, etc. Size: 4" x 3" x 1.3"
The file list (above) displays recorded conversations. Users simply double click on the wave file to hear what was recorded. Furthermore, the user can add bookmarks and write notes while a conversation is being recorded. On the right we see the comments column where comments were entered about the file. Once a comment is entered it becomes a pre-selected point from which a conversation or recording can be heard. I.E. once the comment is double clicked the recording starts to play from that location which in this case is 9 minutes into the recording. The file displayed above in the recorder is a teaching file for new employees which need to learn our voice mail system (AdminOCX). They basically get a recorded file and add comments to it as they listen. Learn faster by listening to a file a few times.